As promised yesterday by Rockstar Games, we now have our first Red Dead Redemption 2 gameplay first look! Prepare to see how melee combat works, how shooting is different from the first game and lots more. The six-minute Red Dead Redemption 2 gameplay footage definitely has a ton of info to pick through. What are you waiting for? Hit play and watch Rockstar Games’ upcoming game come to life. According to the narrator, the next gameplay video will focus on missions, activities, enemy gangs, robberies, and more! Oh, we’ll also see the evolution of sharpshooting using the “deadeye” system. It’s definitely one impressive gameplay video, so make sure to give it a watch. 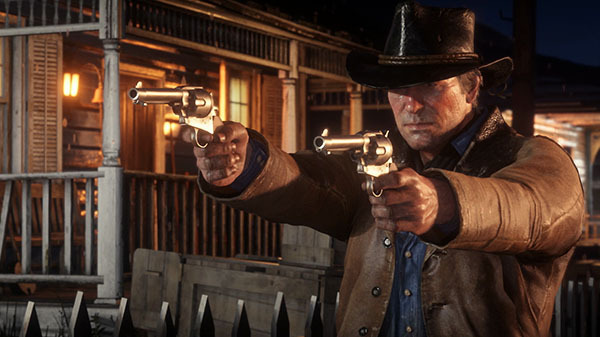 Prepare to see horseback riding, shooting, fighting, and even some boring, humdrum stuff that makes it plain as day that RDR2 will be a living, breathing world. Red Dead Redemption 2 will be available this October 26 for the PS4 and Xbox One.